What a difference to the last time we were in Yarmouth. 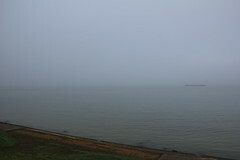 I was expecting substantially better weather as the day wore on, but we eventually had to set off back to Southampton in the murkey grey. The ship you can see out there is the Islay Trader. A somewhat belated Happy Christmas and new year to everyone. Now that's all over, things should start getting back to what currently passes for normal in my life. Suffice to say we had our fair share of weather during December. 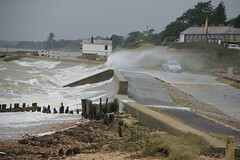 The picture shows the wind and waves over at Leape, near Beaulieu, the other day.